Wednesday through Friday, SportsCenter and ESPN’s NFL shows will originate from downtown Houston – adjacent to the Toyota Center between Austin, Bell, LaBranch and Leeland Streets, while Mike & Mike, First Take and Outside the Lines will be live from nearby Lucky’s Pub. Fans are invited to view live programming from both locations. Additionally, ESPN Radio’s The Stephen A. Smith Show and Russillo & Kanell will broadcast from Radio Row at the George R. Brown Convention Center. SportsCenter On the Road (Mon, Wed-Sun from various locations): Hannah Storm, Sage Steele, Cari Champion and Steve Levy rotate as hosts of ESPN’s flagship news and information program. Additionally, Michele Steele will file SportsCenter content for social platforms and TV. First Take (Wed-Fri from Lucky’s Pub): ESPN’s weekday morning debate show features Stephen A. Smith, Max Kellerman and Molly Qerim. Outside the Lines (Wed-Fri from Lucky’s Pub): Bob Ley reports the news and provides analysis and unique perspective, while leading in-depth discussions with the biggest names in football. NFL Insiders (Wed-Fri from downtown Houston): Suzy Kolber (Wed, Fri) and Wendi Nix (Thu) host with Hall of Famer Bill Polian, NFL Front Office Insider Louis Riddick and NFL Insiders Chris Mortensen and Adam Schefter. 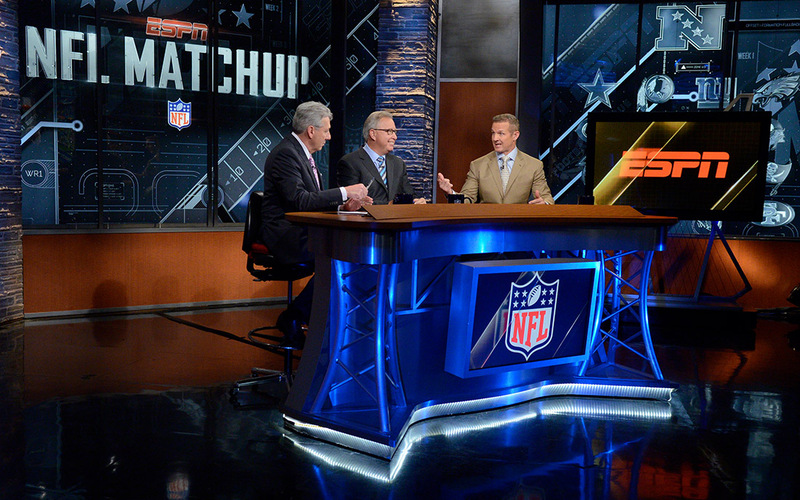 NFL Live (Wed-Fri from downtown Houston): Trey Wingo hosts with Super Bowl champions Tedy Bruschi, Ryan Clark, Mark Schlereth and Charles Woodson, former Pro Bowl quarterback Matt Hasselbeck, and Schefter. Other ESPN properties, including ESPN Radio and ESPN Deportes will also have live coverage from Houston leading up to the big game.